Following the enthusiastic response to my February 17, 2015 ‘Pre-Esxence’ post, in which François Duquesne, CEO of Beauty Entreprise dubbed Esxence ‘The Sundance of Artistic Niche Fragrances, I thought it was only fair to let my other niche perfume friends chime in on their thoughts about Esxence. So, I contacted a bunch of people – brand owners, perfumers, retailers, agents, distributors, reps, sales managers, and a line-up of free-electrons. I was amazed by the volume and enthusiasm of their response. * Esxence is the essential artistic niche trade show in the world for making professional and personal contacts on a global scale. * Some of the hottest new niche fragrances of 2015 will be launched at Esxence. * Esxence has an abiding ambiance of joy, generosity, and positive energy. * Many, many thanks to Silvio Lévi, for making it all happen. Esxence is like one giant four-day niche fragrance cocktail party where some of the most imaginative people on the planet get high on perfume – and on each other. (Oh, yes, and really work HARD!). But don’t listen to me, listen to the people of Esxence. They are the voice and spirit of niche perfume! With Esxence only a week away, there’s only one thing to do if you’re not already on your way: Get yourself a ticket – fast! And while your booking your travel arrangements — listen to the voice and spirit of niche perfume…. Anne-Sophie Behaghel and Amélie Bourgeois, the dynamic perfumer team at Flair Paris. Nicolas Chabot, CEO, Le Galion Parfums. “Esxence is a particular moment in the life of a niche perfume brand. The moment when the curtains open at an opéra and start the launch of all the years to come. It’s also such a nice time to share, to give and to receive the comments and the passion of all fragrance lovers. Vanina Muracciole, up and coming Independent Perfumer, Paris. Neela Vermeire, Owner and Creative Director, Neela Vermeire Creations SAS. Michael Edwards, Perfume expert and author, Fragrances of the World 2015 The Fragrance Bible ®, (31st Annual Edition now available). Philip Hillege, Co-Owner, Skins Cosmetics (10 shops in the Netherlands and Ibiza City). Chi Wai Tang, Co-Founder, The 13th Note, China. Rossella Caputo, International Sales Manager For Brands: Peccato Originale, The Vagabond Prince, UNUM, and Rubini. Etienne de Swardt, Founder, Etat Libre d’Orange. Jean-Claude MAGRET, Owner, J.C.M STUDIO, Paris. “What do I love most about Esxence? The Profusion of Talents! Prudence Kilgour, Owner and Creative Director, Prudence Paris. Patricia de Nicolai, Perfumer and Owner of NICOLAÏ, Parfumeur-Créateur. Cécile Zarokian, the independent and highly gifted perfumer and owner of CECILE ZAROKIAN SARL. François Hénin, Owner, Jovoy Parfums Rares, Paris. 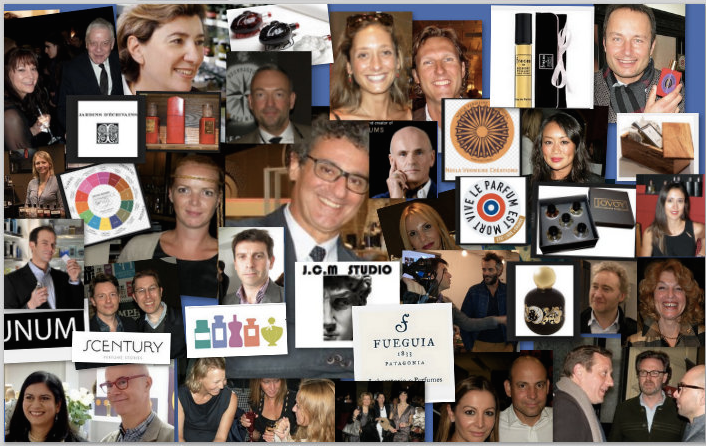 “Esxence is the most important meeting of the year for luxury niche perfumery. As the saying goes, “information is the sinews of war”, and Esxence is the best place to get a good idea of what will come up in the next months. This year I will be showing the first new extracts of the Jovoy perfume brand, as well as a secret project, that only my partners will see. I already have some feedback from the market on these launches, but meeting everybody at Esxence will tell me more about our potential. Bayly Ledes, President, Robert Piguet Parfums, Paris. Roja Dove, Master Perfumer, London. Karen V. Marin, Business Development Manager, Parfums Givenchy. Wouter Wiels, Belgian Trend watcher and Trendsetter, Founder of the Annual Paris Rives de la Beauté event. Mindy Yang, Vice President and Curator, MiN New York. Dr. Bodo Kubartz, Managing Director, Passion and Consulting. Puredistance Master Perfumes, the Netherlands. Nele Tammiste, International Sales Manager, and Iris Vos, Creative Multimedia. Céline Verleure, Founder and Creative Director, Olfactive Studio, Paris. Kathryn Malley, General Manager, Lafferty’s, Germany. Anaïs Biguine, founder, Jardins d’Ecrivains, Paris. Nicolas Cloutier, CEO, NOSE perfume shop, Paris. Sarah Blair, Co-founder, Map of the Heart, Australia. Lorna McKay, Co-Founder, The Perfume Society, London. Giselle Richardson, Owner, Barfumeria Retail, S.L, Madrid. Julian F. Bedel, Perfumer & Founder, Fueguia 1833 Laboratorio de perfumes, Argentina. Helder Suffenplan, Trendwatcher and Trendsetter, Founder and Editor of SC E N T U R Y, Berlin. Always enjoy reading your blog. Thanks for posting. All this creative and edgy niche stuff — perfume, art, music — is right up your alley, Marie. Maybe you’ll come next year. Meanwhile, I’ll do my best to bring it alive for you.